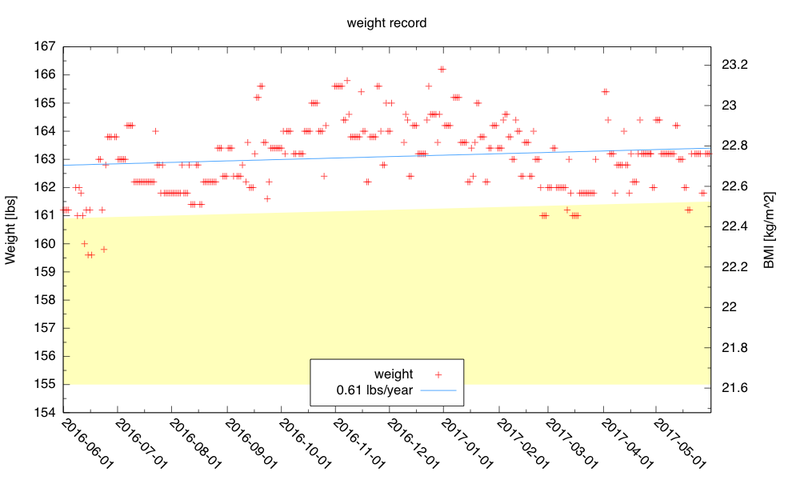 This post is yet another weight progress report, continuing the previous one, this being the 22nd since I started in January 2015. 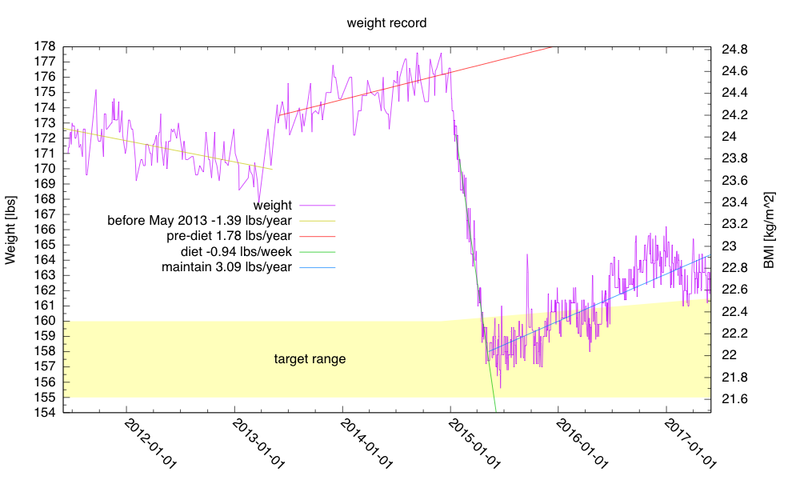 I had a gradual rebound after my concerted effort to lose weight, and I’ve not been able to get back to where I was when I declared my diet a success. My weight is leveling off, around 163 pounds, but not really dropping as I’d like. My goal for Spring quarter was to get my weight back down to 158 lbs, another 5-pound loss, which is not possible in the remaining 2 weeks, as I have not even been able to hold steady at a my mid-March weight, much less lose. My exercise for May 2017 was about 5.35 miles a day of bicycling, but exercise does not have much effect on weight (except at the extremes of no exercise and endurance racing). I have a Black and Decker electric lawnmower (model MM1800 type 1), which I have used for a few years, ever since my previous electric lawnmower failed. 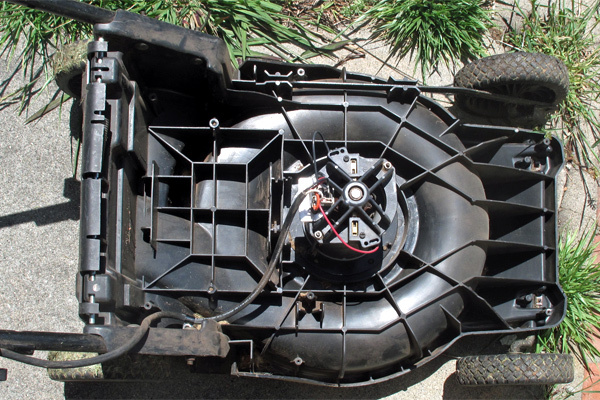 A few weeks ago, the lawnmower failed while I was mowing the waist-high grass in the backyard (a heavier load than the mower is designed for). The failure mode was an interesting one, though—it blew the circuit breaker for the outdoor outlet. I figured that some of the wet grass had gotten into motor compartment and shorting out the circuit, so I left the mower in the sun for a couple of hours to dry out and tried again. It still blew the circuit breaker, so I put the mower away until I had time to work on it. The mower is very simple, and looks pretty good after all the grass clippings have been removed. All those spaces between the reinforcing ribs were packed solid with grass clippings. I thought that perhaps the huge buildup of grass clippings had been causing the short circuit, but after removing all the grass, I saw no signs of blackened wires or other evidence of arcing. I also disassembled the switch handle to look for evidence of shorts there. Again, there was nothing visible. I tried powering up the mower while it was open—still the circuit breaker blew instantly. There is easy access to the wiring. Here is what the rectifier looks like in situ. The four wires are on slide-on connectors, and the rectifier is screwed to a small metal plate that acts as a heat sink. I got out my cheap ohmmeter and started checking continuity and measuring resistances. I quickly determined that the switch was working correctly, and the the motor itself did not seem to be shorted, but the bridge rectifier was acting as a short across the AC inputs, even with no load connected. I then looked online and found a site that said that the bridge rectifier was one of the most commonly failing parts for the Black and Decker mowers, and that Black and Decker charged ridiculous amounts for replacements. They also said that the part was a 15A, 400V bridge rectifier in a standard package. 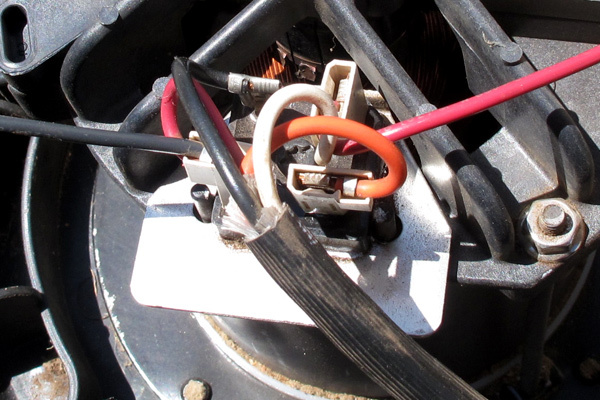 The one in my mower was labeled GBC2504, which is a 25A, 400V bridge rectifier (so, for that matter, is the own shown on the web page that claimed it was a 15A one). I ordered a 50A, 1000V bridge rectifier from Digikey, which cost $1 more than the closest equivalent to the one Black and Decker used, but even with shipping was half the price of the list price of the poorer rectifier from B&D. Based on the derating curves on the data sheet, the 50A bridge rectifier should be able to run about 30°–40°C hotter before it fails. My only concern is that this might be too good—that B&D was using the rectifier as a cheap point of failure at high temperatures. With the better rectifier the motor might overheat and burn out before the rectifier fails, and a replacement motor is not a $3.50 part. UCOP (University of California Office of the President) and the UC Regents recently decided to limit out-of-state students at UC campuses. But they did not do so uniformly across all campuses. They decided to let UCB, UCLA, UCSD, and UCI have more out-of-state students than the other campuses and to keep the extra tuition collected. This continues a pattern that has been in place at least as long as the 31 years I’ve been at UCSC of ensuring that UCB and UCLA get more funding per student than the younger campuses. I’ve seen no evidence that UCOP or the UC Regents have any intention of ever treating the campuses equitably. Even when they are strongly pushed to do so, they find ways to weasel out and bake in extra money for UCB and UCLA (like the “rebenching” initiative, which was touted as redressing imbalances, but ended up making them worse). I don’t usually give exams in my courses any more, because I’m more interested in what students can do when they have time and resources than what they can do on toy problems under resource limitations. But if students don’t do the homework, then they don’t learn the material, so I threaten each class that if too many students don’t turn in the homework, I’ll have to add a quiz (worth as much as one of the lab reports, each of which is equal to all the homework) to the course. This quarter I had to follow through on that threat, because 12% of the class had turned in half or less of the homework (and by that, I don’t mean answered half the questions—I mean turned in nothing at all for half the assignments). A quarter of the class had not turned in 25% or more of the assignments. I gave the quiz yesterday, with 6 easy questions that only tested the very basic material: single-pole RC filters (passive and active) and negative-feedback amplifiers. I told students ahead of time (and on the exam) that they could use the Bode approximations (the straight-line approximations to the gain of the RC filters) and we even reviewed them in class last week. There were 60 points possible on the test, and none of the questions were design questions—they were almost all of the form “what is the corner frequency?” or “what is the gain of this circuit?”. There are a small number of students in the class whose probity I have reason to question, so I took steps to reduce cheating that I would not normally bother with: I made up two versions of the test (same schematics, but different component values) and alternated them in the piles passed along each row. I also had the students sit in different rows from usual, reversing front and back of the room, with the front row reserved for latecomers. I’ve noticed a high correlation between good homework grades and people being on-time and in the first two rows, so I had those students sit in the back row, where no one would be able to copy from them. Even if students really didn’t understand complex impedance or RC filters, 39 of the 60 points could be earned with just DC analysis of the negative-feedback amplifiers and knowing that capacitors don’t conduct DC. So I was hoping that students would do better on these very easy questions than they did on the harder design questions of the homework. As a confirmed pessimist, though, I expected that students would show almost exactly the same distribution on the test that they showed on the homework, with the middle of the class being around 20 out of 60 points and showing serious misunderstandings of almost everything, with a long tail out to one or two students who would get almost everything right. I also expected that the correlation between the homework scores and the quiz scores would be high. The median is indeed 21 out of 60, as I feared. At least no one got a zero, though the scores at bottom indicated complete failure to apply the basics of the course. Most students could compute a corner frequency from a resistor and capacitor, but few had any idea what to do with that corner frequency. Many students could compute the DC gain of a non-inverting amplifier, though many could not then apply this knowledge to the DC gain of an active filter (which only requires replacing the capacitors with open circuits). A lot of students forgot the “+1” in the formula of the gain for the non-inverting amplifier. Inverting amplifiers were even less understood than non-inverting ones, with students forgetting the minus sign or trying to use the formula for non-inverting amplifiers. A lot of student answers failed simple sanity checks (students were having passive RC filters with gain greater than 1, for example). Very few students used the Bode approximations correctly, and many tried the exact solution but either couldn’t set up the formulas correctly or couldn’t figure out how to use their calculators, often getting numbers that were way, way off. Others seem to have ignored the complex numbers and treat as if it were . Pearson’s r correlation is 0.539 and Kendall’s tau is 0.306, so the homework and quiz scores are highly correlated. There are a few outliers: a diligent student who bombed the quiz and a student who has turned in few of the homeworks who actually understands at least the easy material. The points have a small amount of noise added, so that duplicate points are visible. 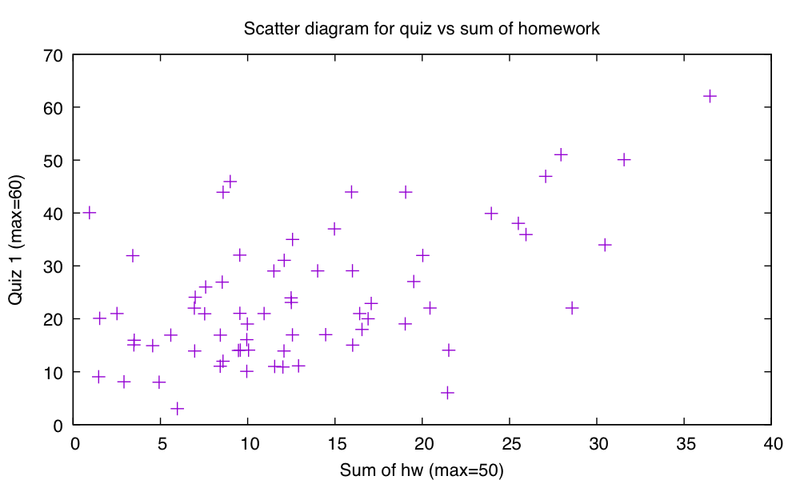 The high correlation between the quiz and the homework mostly confirmed my prior belief that the quiz would not tell me much that is new, and that the homework grades were pretty reflective of what students had learned. I will want to talk with a few of the most extreme outliers, to find out what happened (why were students who mostly understood the material blowing off the homework? and why did diligent students who had been doing moderately well on the homework bomb the quiz—is there undiagnosed test anxiety that should be getting accommodations, for example?). Most of the points that were earned were from students randomly plugging numbers into a memorized formula and (perhaps accidentally) having chosen the right formula and the right numbers. Only a few students showed real understanding of what they were doing, and only one student saw the quiz as the trivial exercise it was intended to be. It seems that the hands-on active learning that I have been so enthusiastic about is not working any better at getting students to learn the basics than the traditional (and much cheaper) droning lecture that EE uses. I’m not in complete despair about the course, as there is some evidence that students have picked up some lab skills (using oscilloscopes, multimeters, soldering irons, …) and some writing skills (though many are still not writing at a college level). But I’m trying to teach the students to be engineers, not technicians, so I was aiming at them understanding how to design and debug things, not just implementing other people’s designs. Picking up lab skills is not enough for the course. I need help. How do I reach the lower half of the class? How do I get them to think about simple electronics instead of randomly applying half-remembered formulas? We’ve only got 3 weeks left—I don’t know how much I can salvage for this cohort, but I certainly would like better outcomes next year.